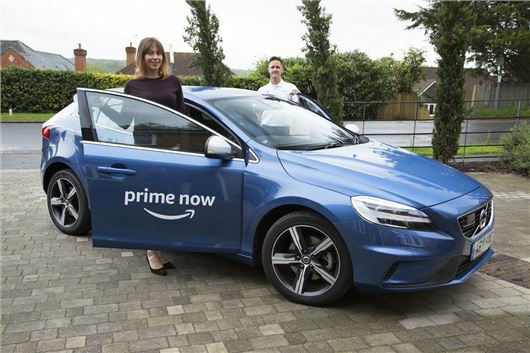 UK drivers can now book a Volvo test drive through Amazon for the first time, thanks to a collaboration with Prime Now - Amazon's quick delivery service. The 'Prime Now test drive' scheme allows customers in London, Birmingham, Manchester and Edinburgh to book a time that works for them, with the car delivered to their home or workplace. The offer only applies to the Volvo V40, and is available on select weekends in June and July. The whole sign-up process takes just a few minutes. Using a mobile device or desktop, Amazon customers simply enter their postcode on the Amazon Prime Now Test Drive webpage, select their location and choose an available time slot. The car will then be brought to the designated location, accompanied by a driver who can explain all of the car's functions. The scheme allows customers to put the V40 through its paces on roads familiar to them. If you're interested in a purchase following the test drive, you will then be directed to your local Volvo retailer. With Google building self-driving cars, DS allowing you to pay for your shopping with your keys and the ability to book a Volvo test drive through a website that also lets you stream Downton Abbey, the question is, what next?